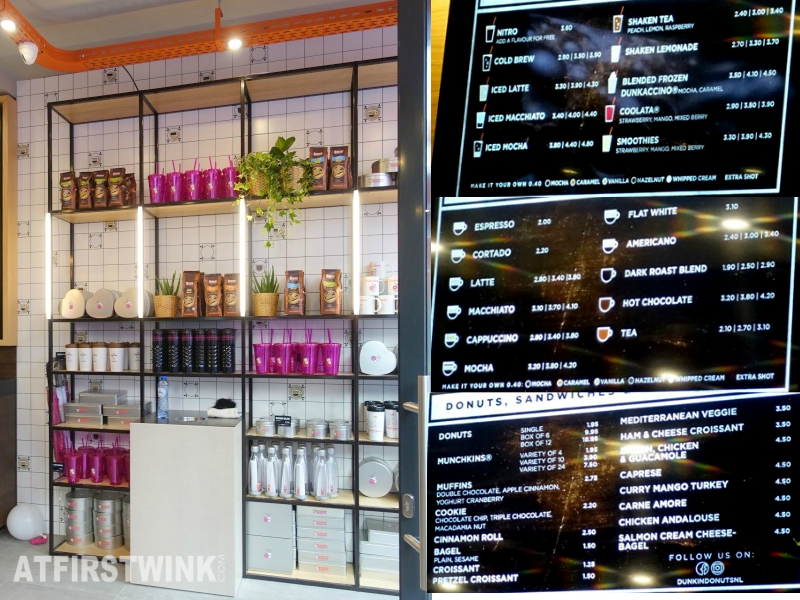 On Thursday 23 March, Dunkin' Donuts opened their first store in the Netherlands, located on Nieuwendijk 147 in Amsterdam. Since their departure back in 2000, the coffee place culture has developed more in the Netherlands. Seeing the success of Starbucks, Mockamore, Bagel & Beans, Coffee Company, Doppio Espresso, Douwe Egberts café, McCafé, and many small local coffee places, Dunkin' Donuts has chosen the right moment to enter the market. This year alone, they are opening several stores spread out in the Netherlands, in big cities such as Utrecht (August) and Rotterdam (September) (source). They have the ambitious plan of expanding the number of Dunkin' Donuts stores to 25 within 5 years. On opening day, it was very crowded and there were long lines. They also awarded the first 100 visitors on 23-24-25-26 March with free donuts for a year (maximum of 6 donuts per week). Instead of the bright orange, purple, red, and yellow colors that is normally incorporated in the interior of the Dunkin' Donuts stores, they adjusted it to the Dutch preferences: a warm homey feeling with plants, tiles on the wall, and lots of wood. Underneath, you can see the price list of Dunkin' Donuts and a wall with the merchandise that they have in the store. Not only is the interior adjusted to the Dutch preferences, there are also special flavors that are only available in the Netherlands: Dutch Blue, Peanut butter, Windmill, Amsterdam flag, Tulip, Drop sprinkles, and De Stroopwafel donut. You can choose from 30 kinds of donuts and two eclairs (Hazelnut and Chocolate vlokken). There are also 4 kinds of Munchkins (donut holes): Chocolate hazelnut, Boston, Hazelnut, Raspberry truffle (covered with the Dutch hagelslag). De stroopwafel (a flat Dutch wafer cookie with syrup in between) is the flavor that won in the "Choose your flavor" contest. I have never eaten a donut from Dunkin' Donuts before, so I was really curious about them. My review of two boxes of them will be posted tomorrow (find it here). What is your favorite?